Brings youth, vitality, health, balance & energy through the power of mind-body hypnosis! This program will help bring back the youthful approach to your life, physically, mentally, sexually and emotionally It focuses on appetite, digestion, excretion and sleeping. It instructs all major organs to become healthy and any lesions to heal. It will help you release all past negative experiences or issues and create a passing from negative self destruction to positive self confidence. This hypnosis CD enables you to see everything as easy instead of difficult creating the feeling of contentment and calm making you the master of yourself. I am one of your avid followers. I have been blessed with your work. Your work has done wonders in my life and for this I am very thankful. I have tried and successfully witnessed the wonders of your cds like Happiness and self-esteem, public speaking, youthful you and overcoming fears (for my son). The changes I have noticed from using A Youthful You are interesting. I have started embracing technology with an attitude of `what the heck, give it a go`. This has meant that I am experimenting with programmes on the computer that had me petrified before, making the excuse that I will never need to use that programme, so lets not fiddle with it. I have enjoyed that change. I have started to learn a language just for the fun of it. I cant wait to see what other changes this CD unlocks. I may even end up taking that hiking trip in Nepal that I have always wanted to do! 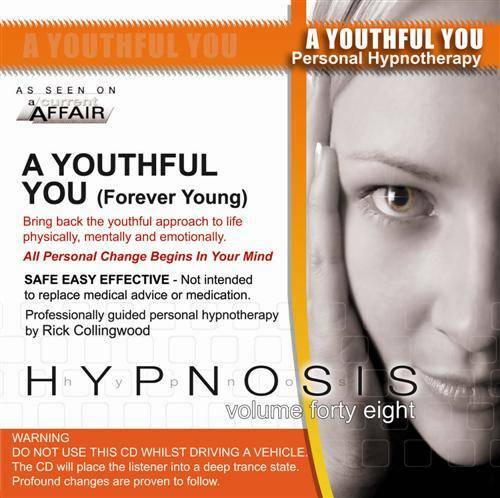 I have been listening to the Forever Young CD now for about 2 months and I have found it works really well. I had a long term illness which forced me to leave my full time employment, I was suffering with abdominal pain, not sleeping very well, very down emotionally and physically exhausted. Since I have been listening to the CD my sleeping has greatly improved and I awake feeling energetic. I now do not suffer from any physical pain or the emotional feeling of “Being Down”. I have returned to full time work. I would certainly recommend Rick Collingwood’s CD to anyone who needs help in regaining their health and wellbeing.